Two lives were lost to reckless drivers in SF this weekend: Two-year-old Mi’yana Gregory and 29-year-old Zachary Watson, whose family and friends removed life support after three weeks in the hospital. Gregory was reportedly run over after she and her family saw a movie on Friday night. 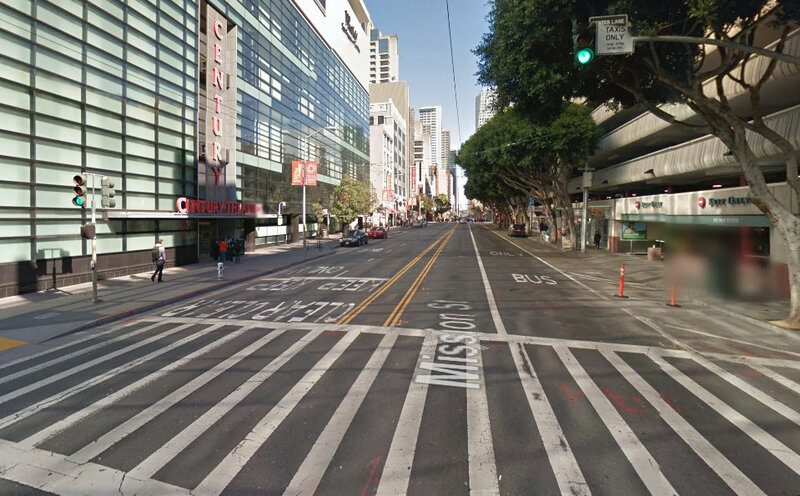 The crash occurred on Mission Street between Fourth and Fifth Streets, in a signalized mid-block crosswalk that connects the movie theatre and parking garage. 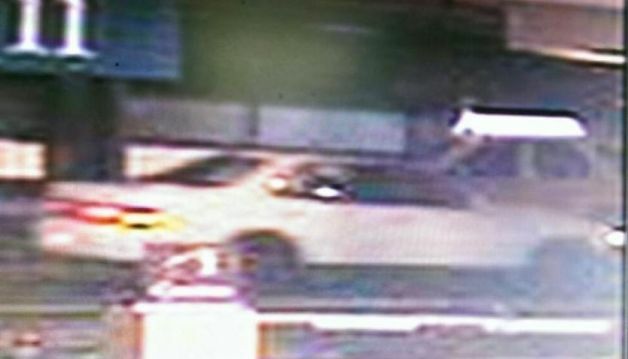 The driver apparently ran a red light and fled the scene, and police have released an image of the 1990s white sedan they are searching for. Family and friends held a vigil on Sunday. Mi’yana was struck at 10:37 p.m. Friday in the crosswalk midway between Fourth and Fifth streets in the South of Market neighborhood. The crosswalk has its own traffic light to stop cars on the busy stretch of Mission, and family members said Mi’yana, her brother and aunt had the light as they crossed the street, heading toward a parking garage opposite the mall. As he spoke, he held Mi’yana’s twin brother, Michael Gregory Jr. “He woke up this morning and asked, ‘Where’s My My?’ ” the father said. On Saturday, 29-year-old urban data visualizer Zachary Watson died after his life support was removed, following a nearly three-week stay in the hospital. Watson was injured on the sidewalk at Post and Jones Streets on July 28, when 25-year-old Anthony Wisner, evading the police, drove a stolen minivan into a taxi, causing the vehicles to jump the curb and knock over a light pole. Wisner faces ten felony charges, which could be modified by the district attorney in light of Watson’s death. Watson was apparently walking with his bicycle and may have been hit by the pole, rather than the vehicles. That’s based on evidence collected by police and the lack of injuries to below Watson’s neck, according to Marc Caswell, who was a friend and former roommate of Watson’s. Even though he was wearing a bicycle helmet, Watson suffered critical head injuries. It appears Watson was also likely walking down one-way Post Street to avoid riding his bike against the flow of traffic, Caswell said. Earlier, he had attended one his regular swing dance classses at The 9:20 Special, a dance venue. Watson was known for creating works such as a Stamen Design map of Silicon Valley’s private shuttle network that gained attention in the transportation planning world in 2012. Caswell made multiple trips from Los Angeles to SF to attend to Watson in the hospital. Watson’s friends and family gathered to remove his life support Saturday at 3:14 p.m., to symbolize pi (3.14) and honor his love of math. Regarding the accident/crime on Mission Street, realize you are not safe unless there is no car coming or better yet, a car has stopped for you. Never trust a traffic light. They can’t stop cars. This really is very sad. No comments seem to be posted, because what can we say? Why do we seem to accept this as the price of doing business? These deaths were entirely preventable. To suggest otherwise is to miss the point of the Vision Zero movement, which is to look at each death in the same way the NTSB reviews airplane crashes and provide conclusions about the changes that should be made to the vehicles and how the built environment is organized. Car was stolen? Put in place greater physical security to prevent cars from getting hot wired. Running red lights? Install a red light cameras in that spot to capture license plates of future vehicles and prosecute the drivers of them. No license plate? Make sure you can’t drive a vehicle without a plate. The fact that we don’t do these things shows how we, as a culture, have decided that these kinds of deaths are simply collateral damage from living in a car-centric world. That the expense to make these changes are too great relative to the human suffering they cause. That they are simply a result of deviant behavior rather it being on a spectrum of behaviors that are encourage by the transport mode or built environment. It makes me so sad that so many people can’t move past their personal convenience with cars and see how we all share responsibility in how much pain and suffering is caused by supporting this lifestyle. My hope for the future is that the repudiation of ‘car culture’ by millennials continues to gather steam and that we finally break the dangerous addiction that continues to take the lives of our friends, neighbors, and colleagues. Actually, the number of motor vehicle deaths has been trending downward for some time now. The 32,479 motor vehicle deaths in 2011 was the lowest in 62 years, since 1949. Motor vehicle deaths drop to 32,479 – what is important is the trend, not the absolute number. Cycling mode share doubles, what’s important is that it’s only 3.4%, not the trend. Fewer people driving or riding inside cars are dying, but the rate of death and injury for people hit by cars while walking or biking has not. That’s because safety improvements we’ve made are all about protecting occupants with crumple zones, seat belts and airbags, and not slowing down traffic to protect everyone. Do you have a source for pedestrian deaths as opposed to all traffic-related deaths?